Data analysis is time-consuming; too slow for business. No more. Get analyses in seconds with Assisted Data Discovery in Yellowfin 7.4. But some things are long overdue for assistance and would make a day in the life of a data analyst a breeze. Have you ever been incredibly time pressured with business analytics demanded at short notice? Or have you set out on an analysis with a goal in mind, but it takes far too long before you see the fruit of your labours and the answers to your questions? What if I told you that you could have Assisted Data Discovery? Yes, machine learning combined with your guidance. As in analyses served up to you with minimal effort on your part. It can be slow and time-consuming to do data analysis. Yes, it’s much quicker than just five years ago, but it’s still not fast enough to meet the ever-expanding demands of business today. Once you have combed the data and cleaned it up, you need to figure out the best way to analyze and represent the data to answer the business question. You spend time and due diligence running through the data to unearth the most relevant insights to present in reports and on dashboards. It takes time to uncover trends, patterns, anomalies, and relationships. But that work is necessary. You can’t just skip any of those steps. That’s why we decided to take action. Yellowfin 7.4 allows you to do the data analysis in minutes. Yes, minutes. How? It does the heavy lifting of analysis for you. I’m not talking about some machine plucking data analyses out of thin air and delivering wild guesses. You have a goal in mind, a particular aspect of data you want to analyze. So you set the parameters and Yellowfin 7.4 (released October 31, 2017) will combine those with machine learning to serve up the results of running your data through various algorithms. It’ll deliver multiple visualizations complete with natural language generated explanations of what’s happening. You can select the analysis that best fits the solution to the problem you are solving and add these straight to your chart builder and work on them from there. You can also use these fast insights as the building blocks for deeper analysis. Can you imagine how many hours that could save you? 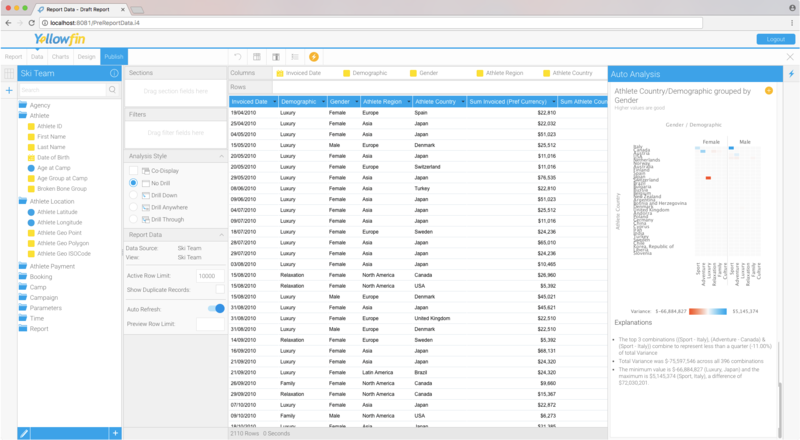 It can take you hours to dig into the data to uncover insights, but Yellowfin 7.4 will serve up multiple analyses, with explanations, in just a few clicks. Incredible. With assisted data discovery, you can rapidly build and deliver content. It also allows you to test proof of concepts faster than ever before. First, select the data you want to query. Then, call on the Insight Wizard. It’s the new lightning bolt symbol on the toolbar. Select which elements of the report you want to query – the metrics, dimensions, or date, etc. – then watch the magic happen. You’ll get automatically generated charts, complete with text explanations of what’s happening in them, from Insight Wizard. The results are delivered in order of their relevance as deemed by Yellowfin. These analyses have been run through regression models, clustering and pattern detection, anomaly detection, and more to deliver insights from multiple angles. It’s smart stuff. And it’s designed to do the heavy lifting for you, so you can get to those insights faster. That means the business can receive your analyses sooner and react faster in the market. You won’t find these capabilities in the feature sets of most other big players in BI. 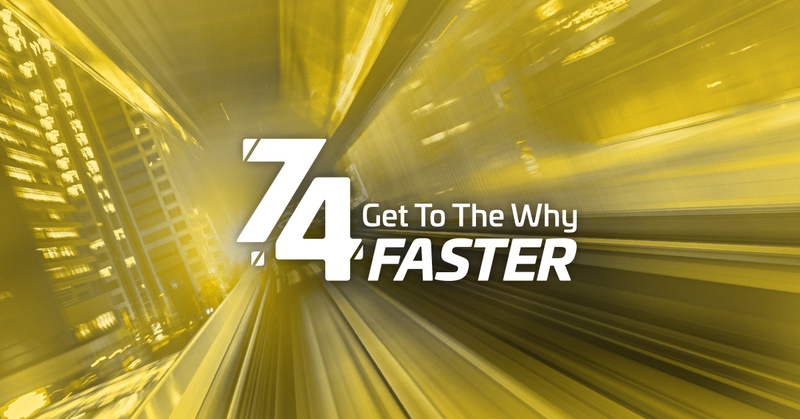 In short, you get to the answer faster than ever before with Yellowfin 7.4. See Yellowfin 7.4 in action. Join the launch webinar on Oct 26th.